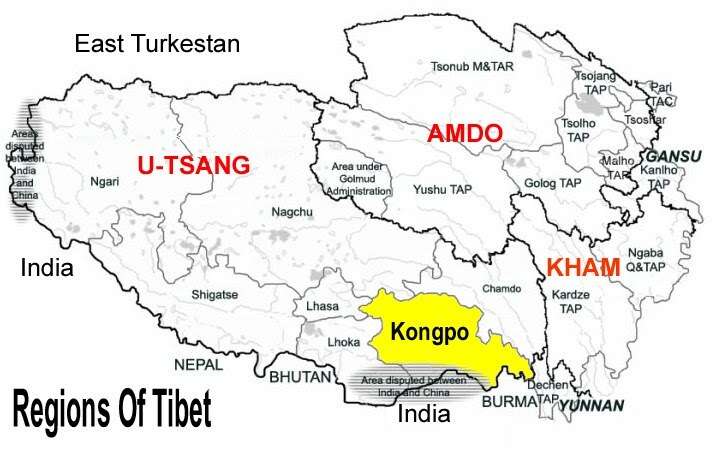 The alternative is to drop the demand for Genuine Autonomy for Dhotoe, Dhomey and Utsang under one giant Tibetan administration over 2.5 million sq-km of territory, and instead demand Mini Autonomy on a landmass of just 100,000 sq-km around Kongpo and the adjoining areas to the west and east of it. Carve out a half moon map and call it Little Tibet in which Tibetans from different parts of the Tsenpo era Tibet can be relocated and yet remain a part of People’s Republic of China (PRC) while Beijing would still control defense and foreign affairs. The authority to enact laws or regulate migration of non-Tibetans to Little Tibet would rest solely in the hands of the Tibetans. PRC would fund the relocation. Mini Autonomy is a high level of autonomy that is similar to the rights and freedom enjoyed by Hong Kong under one China two systems or Sikkim or even Ladak –the Little Tibet of India. Given the political reasoning of the MWA proponents that compromise is the key means available to strike a deal with PRC; this proposal is highly sensible and reasonable. Mutual agreement can be reached in a couple of years and Little Tibet can materialize within a decade and the bardo of Uma and Rangzen (Proponents of autonomy within China and Tibetan independence respectively) will finally come to an end. What more can we ask? This proposal is far more realistic than demanding Genuine Autonomy over 1/4 of the current Chinese Territorial size. PRC can never let go such a vast resourceful territory to a non-Han people whose population is less than 1/226 of the overall PRC population. Mini Autonomy over Little Tibet is definitely more practical than hoping for the grand Genuine Autonomy that has china losing everything and gaining nothing. If there is any basis of hope for Genuine Autonomy, why wouldn’t there be more basis of hope on Mini Autonomy over Little Tibet where the demand is over only 100,000 sq-km or just 4% of the 2.5 million sq-km of Tibet, and the remaining 2.4 million sq-km or 96% of the disputed territory is given up completely? Whether PRC blows up mountains in the given up areas for uranium or transfer to the valleys a Chinese population of 100 millions over night would be none of our business once an agreement is reached. PRC shall enjoy the vast Tibetan territory and its resources worth hundreds of trillions of dollars for the next millennium and beyond with no disruption or protest from us. This approach will silence the Chinese accusation that Tibetans are seeking independence in disguise. Producing this result will close down Rangzen camp for good and we shall all be reunited with our brethren in Little Tibet enjoying the fruits of Mini Autonomy. Meanwhile, Tibetans from every part of Tibet should start moving defiantly with their belongings including livestock to Little Tibet. Locals in Little Tibet should welcome them with tents pitched near their dwellings. The ground realities are tough but the idea and the process must not be mistaken for an indian reservation in the US. The fact that the Chinese are in Tibet for the greed of the land and its resources, not for the love of the Tibetan people is obvious. For Tibetans to relocate is not an issue for most of the Tibetans are or were nomads for centuries so to be on the move is nothing new, and to relocate one big time is no big deal. Nearly three thousand Tibet Tibetans on foot crossed over the 300km wide snow covered Tibetan Himalayan borders in mid winter to Nepal and India every year from 1980 to 2008 with the minimum clothing and no equipment whatsoever and majority of them walking their way back through the same treacherous route after tasting Dharamsala for awhile. Migrating to Little Tibet in freedom should be an indescribable joy. The fire that burns within the chest of every Tibetan including new comers inside India, Nepal , Bhutan to migrate to the west at substantial personal cost, sometimes incurring debt as high as $40,000 per person is true and impressive from a business perspective. Moving to a stunning corner of your own known familiar country with a certain future with your own folks in charge should be even easier. With each passing day we as a people are nearing extinction in our own land. Ironically, the threat of extinction comes not from the guns of the Chinese troops guarding the Himalayan borders in the distance but from the millions of innocent looking Chinese civilians in our villages and towns and cities. The Chinese population in Tibet is now estimated at 12 million to 15 million and it will continue to rise rapidly. Such massive Chinese population would engulf Tibetans in opportunity, modernization, education, jobs, language, business, sports, administration, trade, culture and politics and we will be forever at the receiving end in our own land. Mini Autonomy in Little Tibet will rescue us from this imminent threat. Since Little Tibet borders with Arunachal Pradesh in the south with a million inhabitants with whom we once shared history and culture, it raises two options, what they are I leave to your imagination, when geopolitical scenarios change in the future. Tibetan love for nature is legendary. Little Tibet is a fertile land rich in minerals, flora, fauna, marine life, air life, fresh water with moderate climate all year round except a little cold in winter but certainly not colder than the freezing Dharamsala winter. With the development of Tibetan instinct for business and passion for education over the years, we can in an Autonomous Little Tibet produce tens of thousands of sharp masters and brilliant Phd’s with a zeal for community progress and creativity, the most important goal of learning and education. Focus on education and business will eventually ensure our political brain power which is behind the fire power that defeats overwhelming manpower as we witness in the Israel- Arab scenario. Located in Tibet Autonomous Region with Lhasa in the North West and Arunachal Pradesh in the South East, Kongpo is one of the most important cradles of ancient Tibetan civilization having been settled as early as five thousand years ago. It is famed for its ancient verdant mountainous terrain and clear waterways. It is indeed a great location to practice and preserve our identity, language, freedom, Buddhism and culture, and while at the same time benefiting from Chinese economic prosperity. This is the ideal spot from where the Dalai Lama can realize his idea of spiritual sanctuary for humanity in distress, a zone of Ahimsa (peace) from which the Dalai Lama can inject reality into his dreams of universal responsibility and harmony of world religions. According to a renowned Tibetan historian Lobsang Shastri based in New York, Nyatri Tsenpo- the first Tibetan king, was born and bred in Kongpo! Also for the faith driven there are numerous pilgrimage sites including holy hot springs, waterfalls, lakes and rivers, sacred mountains, and the trails of Guru Rinpoche, Thangthong Gyalpo, Dorjee Phagmo and also the famous Kongpo Ben Rock! Yarlung Tsangpo River also cuts through the Kongpo making the famous Yarlung Tsangpo Canyon which is 496 kilometers long and is four times deeper than the Grand Canyon in America. 16,000 feet deep! It is, in fact, the deepest canyon in the world and this fact alone can ignite a mega tourist industry for self sustenance, peace and prosperity. 20,000 sq-km of the southern Little Tibet can be declared a wildlife sanctuary protecting world’s endangered species from wild yak (the symbol of Tibetan freedom) to magnificent tigers, generating extra revenue through wild life tourism while also helping the world become less poor and less ugly. What a double contribution, one at local level and the other at global Dharmic level! Those who may feel emotionally betrayed because of the perception that your local land is given up need not feel so. Whether it is Siling in Amdo or Chamdo in Kham or Lhasa in Utsang, they all belong to all the Tibetans and not just to the locals. Similarly, Kongpo and the adjoining areas belong not just to Kongpowas or Pemakoepas or Zayulpas or Lobas but to all Tibetans. What is given up to PRC and what is demanded from PRC belongs to all of us Tibetans equally. For now the fact remains we do not possess control over an inch of our land and the independence struggle has been abandoned for four decades and no Genuine Autonomy in sight. Everything in Tibet is Chinese for six decades now. The walls are closing in on us. No amount of petty immature internal bickering will make this eventuality go away. Find a way and adapt or die. However beautiful and realistic Little Tibet may sound, it will not come about voluntarily. In politics, there is no such thing as free lunch and we have to struggle for every scrap of it. And in the absence of a top down and a bottom up struggle in the true sense of the word, not even 1 sq-km of the barren Jangthang will be given to us for underneath that small piece of land, feeling no threat whatsoever from us, the Chinese occupier sees, regardless of whether it exists or not, oil worth $10 trillion. A war between India, Japan, and the US on one side, with China on the other side of the power spectrum can result in any possibilities in our favor but for the foreseeable future such a mega war is highly unlikely due to mutual vulnerability of nuclear proportions. Whatever the case might be, we cannot afford to wait praying any longer. The birth of Little Tibet will come about when each and every Tibetan recognizes the necessity of fulfilling this humble and yet realistic vision, it will come about when we realize Mini Autonomy is like the air we breathe, the first and foremost requirement for our survival. That it will come about when we reject blind faith and the emotional blackmailing from our leaders. That it will come about when we reject apathy as bliss and cronyism as getting smart. That it will come about when we embrace critical thinking, rationality, and problem solving skill. That only through nonviolent action, hardship, sacrifice, militant action and diplomacy can freedom be won eventually. In my final post on this, I will share with you the practical ways and means to get there. Until then stay glued!